Sour Pickles – Fermented Goodness! As I hinted at in my last post on pickles, there are two kinds of pickles in the worldâ€“those that get their flavor from spice and those that get it from fermentation. The second type are known as sours, or brined, but some of the regular pickles you get from the store are fermented, too. The basic difference is that with sours bacteria in the pickling liquid creates lactic acid which helps make the liquid acidic. The salt in the liquid helps encourage the good bacteria, and keeps away the bad bacteria. The good bacteria then raises the acid, helping to further keep away the bad. The other approach is using vinegar to get the acid in there and then other flavors. Both approaches work, but I am a sucker for a good old fashion sour pickle. Sour pickles can be a little daunting though. You are letting bacteria run wild in your food. That takes a little bit of cooking guts. The truth is that it is no tougher than making refrigerator pickles. People around the world have been fermenting vegetables for eons, so have a little faith in this, but just keep an eye if things seem a bit weird. Bacteria is at work, so there may be scum on the surface but that is normal. Instead look out for pickles that feel slimy or overly soft. 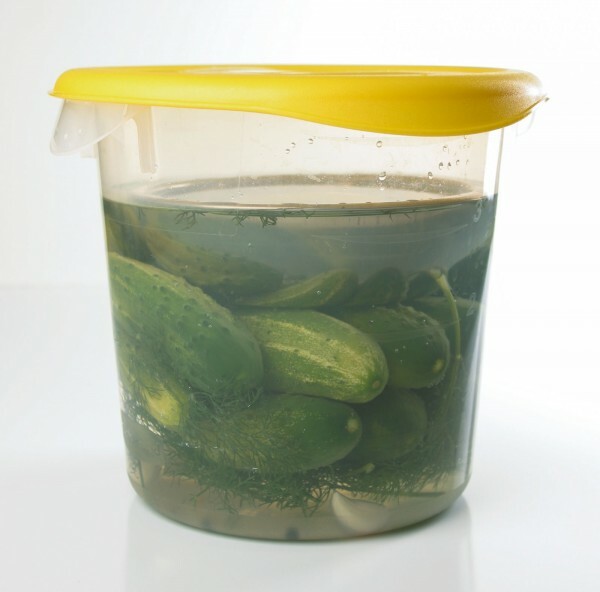 There are two aspects of brining pickles that control the pickling process: temperature and the salinity level. The bacteria that produce the lactic acid do well in a salty environment; lots of other bacteria donâ€™t. However, the saltier the liquid is, the slower the bacteria reproduce. Bacteria also react differently to temperature and reproduce more the warmer it gets. If you work with these two controls you can create an environment that favors the yummy bacteria that you want. This is my first pickle fermenting experiment in a long time. The results were really good, but a little salty. For the next go around, I am going with a slightly lower level of salt and using a recipe from another DC local. I will follow up with results from that batch. The higher level of salt in the first batch meant that it took longer for the bacteria to do their work. The second batch, with less salt, is moving along a lot quicker. The second batch should be much more sour and have a more pronounced tang. I got the first recipe from a great website that focuses on fermented food from around the world. The author has a book on it and I think I am going to have to order it. I rewrote the recipe because I skipped a lot of steps and ingredients, so check the original for some additional flourishes. Pickle Packers International â€“ The trade org for picklers. They have good info on uses for pickle juice and a good overview on how pickles are made. A very detailed document on the science behind pickling. The website seems to have trouble though and isnâ€™t always available. Keep trying! Another recipe for Kosher dills, fermented of course! Make sure you read The Slow Cook, which is not only a great blog on food but also has great pickle recipes. 2 lbs Kirby cucumber, unwaxed. 1 plate or bowl which is close to the diameter of the container, used to hold everything under the brine. I’ve been on a sour pickle making quest the past couple months trying various recipes. Definitely learned a lot and think I found a brine % that works for me, but almost all my batches have a funky yeast off flavor (smells like the scum you skim off the top.) Any way to minimize that? My latest batch is more passable, but used the same brine % as my previous “success” but there’s still a hint of funkiness. Also, as a tip, I’m a home brewer and have ph test trips on hand. It’s helped me a lot to slice a cuke and swab the test strip to get an idea of what ph (how sour) my pickle is. I find that a ph of 3.6 is about right. I made 3 batches of pickles and tweeked it I got the third batch really good and sour/garlic kerbys gave them to friends and had rave reviews had 2 big jars in my fridge and still were perfect for weeks. I then made my forth batch the amounts of salt per water 6 tablespoonsfull for two quarts of water I measure exact amounts and write everything down not to make any mental errors. I usually do two separate batches of two quarts. I put them in a warm room maybe near 80 degrees and never had a problem on previous attemps, but this time got lots of small bubbles on top little scum, and every day I put a cover on them and turn them upside down and shake them a little. I usually keep them between 12 and 15 days without a problem. This time after 8 days I checked them and found many mushed and ruined out of 22 pickles I lost more than half. Very depressing…can;t figure out what went wrong…Old pickles? I washed them, did the same exact thing with the previous great ones, distilled water, no viniger, any insight or sometimes this just happens? I am trying to salvage the remaining pickles that haven’t gone to mush. I made the pickles..left it for 7 days and they became really fizzy which was pretty cool because i like the tangy/fizzy but overnight the fizz disappeared. The airlock was on so that not a cause…Does this suggest all the good bacteria died? Nourishing Traditions has many recipes for fermenting vegetables and fruits…you can use whey or double the salt, keep at room temperature for 3-6 days then transfer to 40 degree temperature. I make them in a gallon, quart, or pint jar. Doubling the salt, 2 tbls./quart, seems to give the crispier pickle. Otherwise, 4 tbls. whey to 1 tbls mineral salt, like Redmonds realsalt or celtic sea salt. For traditional sour pickles, you don’t have to add sugar. That is because a bacteria converts the sugar in the pickles into an acid, making the brine acidic. Recipes that call for adding vinegar generally don’t involve fermentation and give you a different flavor. Well first batch gone to mush…Had to throw them away. Too mushy… Second batch gone too….Not pickled enough.. well the taste wasnt sour. Had a great crunch and these were whole not sliced like the first batch…. When I started out the sliced ones were quiet tasty on the 3rd day but their taste diminished rather quickly. They became slimy.Ugh…! The second batch were whole and really crisp but had the flavor of stump water…Ugh you know kinda like gatorade…the peel was kinda soft and the inside was that of a great picle but the taste was horriable. The room where kept was a 80 to 95. The brine was a milky color and had scum floating on top. Where did I go wrong….Didnt mind wasting the first couple of gallons but the 4 gallon crock was dishearting.. I guess tweaking your mix is part of it..
Bummer! So I have a theory, but I haven’t had a chance to test it out. In order to make a good pickle, you want to maintain a constant level of salinity. However, as the brine pulls some of the water out of the pickles it gets less salty. It might be worth trying to put less cucumbers in the crock so that there is lot of extra brine. That way as the cucumbers pickle, less water will come out proportional to the brine, and it will become less watered down. Ideally there would be some formula that takes the weight of the cucumbers, the weight of the water and tells you how much salt to add. Either way, try a batch with less cucumbers and a lot of brine. It should help keep the salt levels stable. Did you use Iodized salt? Kosher salt or sea salt is the best and will not make the brine cloudy. Good luck!! Oh!!! !….I may have made a mistake…After following one of the recipies here for sour pickles I didnt forsee the DO NOT SLICE! It was stated that sliceing would interfer with the fermenting process. Well it was only a couple of gallons. Glad I grow my own cuckes. Now that there coming in I gather about 2 gallons every day. In the next week or so I will be getting a couple of bushels everyother day. Yeah!! I love cucumbers so I plant, plant, plant. I love my dills with hot peppers pickled together and green tommytoes, no such thig as too much garlic! A salt/vinegar brine. I think it should still work. Sliced pickles ferment a little bit faster so you might want to check on them more often. They will still be tasty! Well 3 days have gone by and I have sampled the pickles.. Not sour enough yet, but they seem to be getting somewhat slimy…UGH! Maybe just me! I will give it a few more days. The skin seems to be real bitter though.. Is this normal? The brine is really milky and lots of bubbles! I think this is normal. Dont have the taste of the peppers in them yet. Does it take longer for the hot peppers to ferment and leven? Any comments will be appriciated…. Hi Charlie sorry about your pickles, this is what i do . 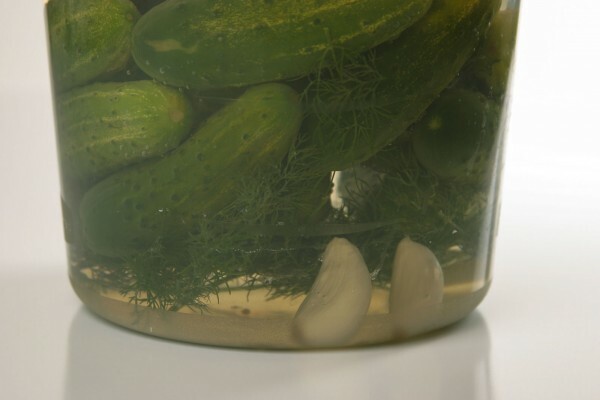 wash pickles put a dill on the bottom of gal jug and 1 clove garlic,then add your pickles at top of jar put another stalk of dill and another garlic clove peeled of course. then take a court jar and add 2 tablespoons of kosher salt and a pinch of powder alum, then fill jar with warm soft no chemicals water.and stir till salt desolves pour over your gal jug of pickles repeat this process till your gal jug is full of the brine soulution. cover with lid but not tight as needs room for fermation.you may have to take spoon and scum off the scum as it accumilates, i did about every other day, about 1 1/2 weeks they were done and oh so good.then i just took the dill from the top of jar and refrigerated them. I just bought an EXPENSIVE container of half-sour pickles from a local producer, only to find that they taste like nothing but salt water. None of the acidity that normally gives half sours the taste I love them for (none of that nice “fizzy” effect either, for that matter). They are inedible. I just can’t enjoy “salt pickles”. Any pickle fans out there know what I might be able to do to salvage these little guys? Maybe anything I can add to the pickle water and leave them like that for awhile? Thanks in advance. There probably isn’t too much you can do. I haven’t found too many jars of pickles that measure up to the taste of real fermented pickles. also check the ingredients. If it lists vinegar, they probably aren’t the real deal. The best I have found are Bubbi’s pickles. They are not cheap though, but they are nice and sour! What you are talking about are marinated pickles, not brined. Because vinegar kills off all bacteria, the taste is very different from brined sours that are sour-tangy rather than sweet-tangy. Search for a “marinated pickle” recipe. I have a question, This is my first time trying to make full sour pickles. I’ve put them in a gallon jar and weighted them down as instructed. My question is this: is it normal for the brine to turn a cloudy milky color? And if so, does it stay this way through the whole brining process ? They’ve been brining for the past 5 days now. I put garlic, dill, coriander seeds and hot peppers in the jar with the cucumbers? Any help would be greatly appreciated. Can you use a one gallon glass jar, made by “Ball” to do the sour pickles in? Definitely! That should work out really well. Glass or ceramic containers are the best because they non-reactive and won’t be effected by the acid and saltiness of the brine. To weigh down the cukes you can boil a rock to sanitize it and then use it to hold them all under the liquid. I have a huge pile of giant and funny shaped cukes. Can I just slice them like hamburger slices and ferment them like that? Those pottery crocks are expensive! Woo! Anyone know where I can find them at a good price? No. Do not cut them up. If you do the surface area to volume radically changes and surface curing or, unfortunately, rotting, takes over. The trick with natural fermentation is to keep the fruit whole. The skin integrity is a natural barrier to invaders much like your own skin. When you cut the cucumber up you remove that protection. 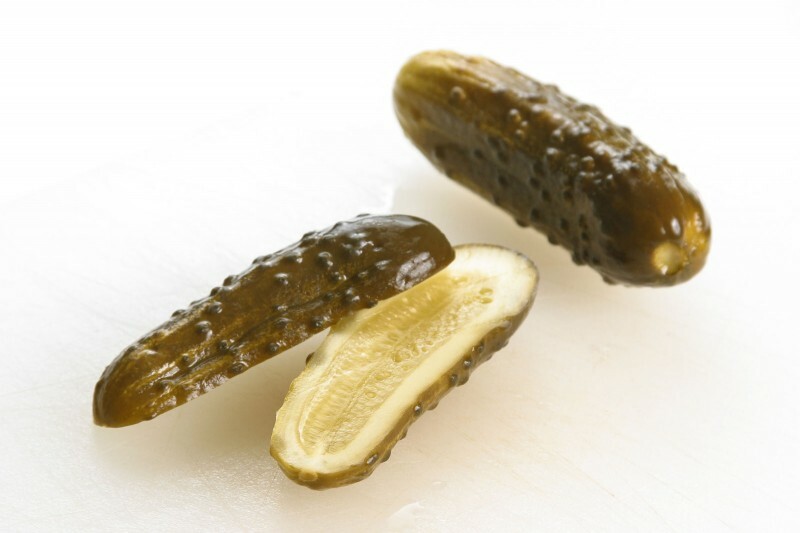 Sliced cuckes are best prepared with a sweet vinegar pickle like bread and butter pickles. As for cheap, bry garage sales. Just mixed up my sreattr; will see what happens over time. How long does it typically take before it’ll start bubbling? I slice mine and they turn out really well. Maybe the difference is I put a bit of fermented garlic and hot pepper mix (homemade) in the brine which really kick starts the fermentation and adds awesome flavor. Kind of like a sourdough starter. I also always use grape leaves and thick skinned pickles. Hope that helps. I have a quick question. I have tried to find fresh dill. I can’t find it anywhere in my area of the world. I was wondering if it will make a huge difference to use dry dill seed. And, if I can, how much should I use? Thank you so much!! Tried this out in my two gallon crockery pot. For the first week they were very salty, but once the osmotic action really kicked in they were perfect. 1 – They weren’t garlicky enough for me so I added about one half head of garlic rough minced for 2 gallons. Mmmm. 2 – To get the good bacteria off to a huge head start and choke out bad bacteria I strained off the whey from a tub of Yogurt with active Lactobacilus Acidophilus – the bacteria that gives the tang… and dumped a quarter cup in 2 gallons as a starter culture. That is a really interesting idea! I saw you can make Greek style yogurt by straining yogurt. You are left with a bunch of whey and this seems like a good use for it. Thanks for the suggestions! In the larger container the packing permitted a larger ratio of vegetable matter to liquid. Up through day two things progressed as normal. Day three presented scum and some mold !!! on the surfaces. Cleaned off and tested liquid and found it almost normal. Supposition is that given the tighter packing of cucmbers and therefore less brine the osmotic action has diluted the salt to the point where some surface mold occurs. having used the starter the flavours and crunch are not compromised at this point. I have added an additional 1/4 TBL per gallon of salt. This should help deter adverse bacteria while letting the Lactobaccilus do it’s job. Dumped in raw my hope is that as it dissolves and is absorbed by the cucumbers that the partial salinity wiil be higher at the top of the crock where infection is most likely to occur. I think you might be on to something. It would be really interesting to measure the salinity of the brine overtime. I bet it would be better to work with weight. You would want the weight of the salt to relate to the combined weight of the water and cucumbers. I will have to do some googling. Update #2: Did as you suggested Luke and worked out weights. Note: This is after the adjustment. Initial load was about 34:1 with the 1 Tbl Salt per Cup of Water. Clearly the need is to use a much larger container, say 10 Gal for 1/2 Bushel pickling cuckes, or I will adjust the salt as time goes on. Too much and the fermentation stops. Too little and the cuckes don’t pickle and fermentation gets out of control. Would be nice if there was a simple way to measure salinity, say by electrical resistance and adust daily to maintain 5%. More Googling. I used your recipe but must have done something wrong I’ve had the cukes brining for 10 days and they aren’t very tangy and the inside is very mushy. Any ideas what went wrong? Hi Kevin, It could be that your cukes were too old/ripe. Using young, small pickling cukes helps guarantee a crisp pickle. It also sounds like the lactic acid bacteria didn’t get started up and perhaps another strain took over. Did you do a good job of washing everything? They may end up being soft inside, but they shouldn’t be mushy. I pickled some cukes but they turned out to be very sour. Is there a way to reduce the “sourness”? Hi Tony, The longer you let them ferment, the more sour they get. I sample them every a couple of days and then just put them in the fridge when they have hit the right sourness. I’ve been wanting to make pickles for a while so I’m glad found this post on your blog. I read it a few weeks ago and was finally inspired this week to step out into the creative world of fermenting pickles. Thanks for the advice, recipe and inspiration. I’ll let you know how they turn out. Please do! Best of luck with the pickles! Laurie, they should come out pretty similar. That being said, every batch I have made has tasted a little different… but they were all great pickles. It is so easy to do, it is definitely worth a shot! So will these come out to be like the good old, Jewish deli pickles? I call them garlic pickles but the local farmers market sells them as full sour. I’ve got a ton of “Rocky” cukes and really need to get moving on the pickling! 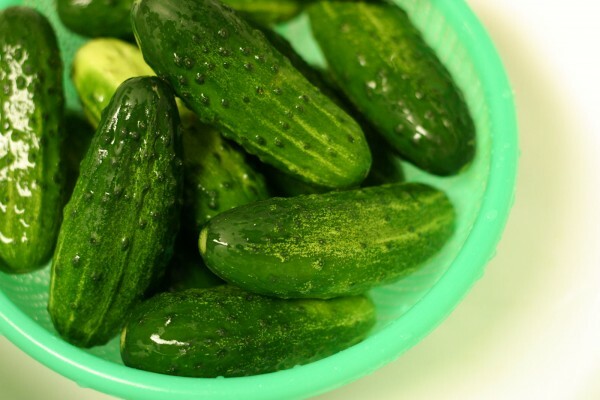 I love Polish cucumbers, especially when they are only 3-4 day old and still half raw :) Long time I want to make them, but I can’t find small cucumbers here in London…. This is on my to do list for this summer. Thanks for the recipe and the links! For some reason, I’ve never been able to grow dill in my herb garden, so whenever I see a nice big bunch at the farmstand, I buy that and some little Kirby cukes, and make pickles. I love being able to control the sourness. Sometimes I want them very sour, other times just barely half-soured. It’s fun to play with those little bacteria.